Living in Florida has many benefits, however a big hindrance is the yearly hurricane season that occurs from June to November. As this blog is being written, hurricane Michael is making landfall on western Florida but affecting thousands all across the state as well as our neighbors to the west and north. 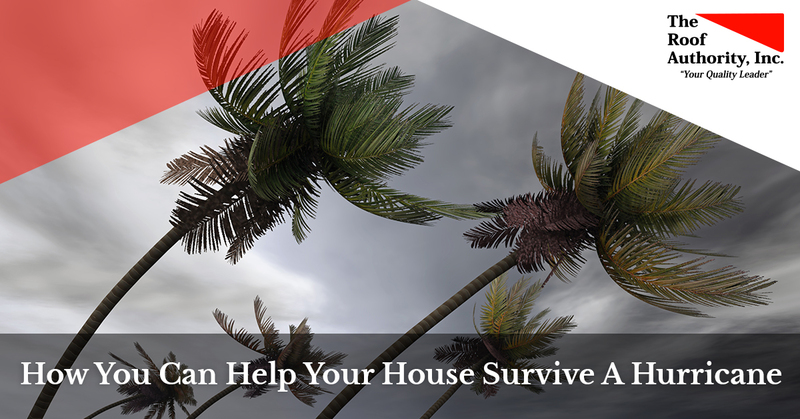 In this blog, The Roof Authority is going to go over a few ways you can help weatherproof your house before or during a hurricane. Please note that the best way to stay safe during hurricane is to evacuate somewhere out of its path. However, if you can’t evacuate and you still have time to prepare your house, implement some of these tips to help your home survive one of the worst natural disasters around. Windows and doors are easy access points to our home. The glass of windows can be easily broken and doors can be beaten in while they’re in a hurricane. Winds can exceed 150 miles per hour, which is enough to rips doors and windows from their fixtures. If loose debris is picked up in those winds, the objects can easily break through glass and act like battering rams to break open your door. When windows and doors are broken, leaving holes and openings to the elements, rain, hail, and other debris can be thrown into your home which adds more damage to your home. The best way to help unwanted water and debris from entering your home is to barricade your doors and windows. You can use plywood, two-by-fours, sheet metal, or any other means you have or see fit to protect your home’s access points from the harsh elements. As long as you use something to reinforce your windows and doors you’ll be helping them, and your house, survive. Just be sure you have a way to get back in and out once the storm passes so you aren’t locked out in either scenario. Loose debris outside of your home can cause major problems for you and your neighbors. Simple things like shovels, wheelbarrows, bikes, tables, and everything else that isn’t anchored down will become a projectile in 150+ mile an hour wind storm. These object will be picked up by the strength of the storm and carried for miles, sometimes crashing into homes, buildings, cars, and even people. Even anchored object can be dangerous with a hurricane over head. Swing sets, hot tubs, even trees have been known to come detached and wreak havoc during a hurricane. The best way to combat debris is to remove it entirely. Put smaller objects inside where they won’t fly away. If they’re valuable make sure you put them in a safe place that can withstand the force of the storm and won’t be found by possible looters. Disassemble playgrounds and above ground pools to make sure they aren’t torn apart or ripped to shreds in the hurricane. If it can’t be moved, anchor the object down with as many ties or anchors as needed to help it stay put through the storm. Park your car in the garage, making sure to reinforce that as well, and be sure everything is put away and tied down for safety. During a hurricane, roofs are in trouble of being blown away and severely damaged. Though you can’t do anything about flying or falling debris, you can help reinforce your roof to make sure it holds up through the storm. Before the storm hits, have it inspected by a quality and trustworthy roofing company. They’ll be able to help tie down your roof when the storm hits and can also help reinforce it so damage is kept to a minimum. You can also anchor your roof with fastening systems, tie-downs, and other anchoring devices to help make sure your home stays in one piece. As we said in the last section, also be sure that your garage door is properly fastened and barricaded. When heavy winds are blowing, garage doors can often fold-in or break, which allows those winds into your home, possibly blowing off your roof. From everyone at The Roofing Authority, we hope that you stay safe should a hurricane ever come your way. As your friendly roofing company in Vero Beach, make sure to stay vigilant and safe during a storm. You can find other helpful hurricane tips in our blog, and if you have time to reinforce your roof, make sure to contact The Roof Authority to help save your home before the hurricane hits. How Does Hail Damage a Roof?